San Diego County’s average rent hit an all-time high in September of $1,960 a month, said a report released this week from MarketPointe Realty Advisors. The increase was mainly led by nine new apartment complexes opening in 2018, all commanding higher rates than what most renters probably experienced. Even with record prices, there is some sign rent increases could be slowing. As of September, average rent increased 5.74 percent in a year. That’s down from 6.36 percent in 2017 and 8.4 percent in 2016. MarketPointe has been producing the report, which comes out twice a year, for more than two decades. Industry analysts have been predicting a slowdown in rent increases for a variety of reasons, including market saturation and affordability constraints. But, in San Diego County, the average rent has continued to grow at more than double the rate of inflation. Russ Valone, CEO of MarketPointe, said there are signs the September average is skewed toward the high end. Valone stressed that older apartments were not seeing the same rate of increase. The average rent for an apartment built before 2000 was $1,787, said MarketPointe. The average rent for an apartment in September that opened this year was $2,887. On a percentage basis, apartments built before 2000 saw their rents increase 5 percent in a year. Anything that opened after 2010 had a 6.6 percent yearly increase. Three complexes that opened in the county in the last six months have some of the highest rents. The new Broadstone North Park development on Texas Street that started leasing in August has an average $2,896 monthly rent; Park 12 downtown, leasing since July, has an average $3,791 monthly rent; and Pierside North in Oceanside, which also started leasing in August, has an average monthly rate of $2,844. Despite signs offering one-month free rent at apartments downtown, there is not a surplus of apartments. The countywide vacancy rate for apartments was 3.72 percent, down from 4.1 percent in March but up from 2.7 percent in September last year. The lowest vacancy rate in the county in September was 1.5 percent for apartments costing $1,200 to $1,299 a month. The highest, at 34.5 percent, was for apartments costing $2,200 to $2,299 a month. Two-bedrooms still dominate the market, making up 52.22 percent of rentals. It is followed by one-bedrooms, 35.89 percent; three-bedrooms, 7.66 percent; studios, 3.84 percent; and less than 1 percent for four-bedrooms. An interesting wrinkle in this year’s MarketPointe report is that the average size of a San Diego County apartment — 882 square feet — is the biggest it has been, according to the company’s records going back to 1988. Valone said apartment sizes have been slowly going up since the 2000s when many baby boomers re-entered the rental market during the recession and, in the past few years, when high-earning workers decided to rent instead of buy. The latest MarketPointe study comes as rent control has become a big topic in California. In November, voters will decide on Prop 10, which would lift restrictions on rent control in California cities. San Diego is still cheaper than other markets, according real estate website Zumper. 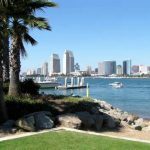 Out of 100 cities, San Diego had the 10th highest rent in October with an average $1,840 monthly cost for a one-bedroom (higher than the $1,733 average MarketPointe reported). The highest markets were San Francisco at $3,650 a month for a one-bedroom; New York City, $2,850; San Jose, $2,470; and Los Angeles, $2,370. Since mid-1998, there have been 40,297 apartments added to the San Diego County rental market, said MarketPointe. Its database contained 134,530 apartments for the September study. « The votes are in: Do sellers control the price in negotiations?